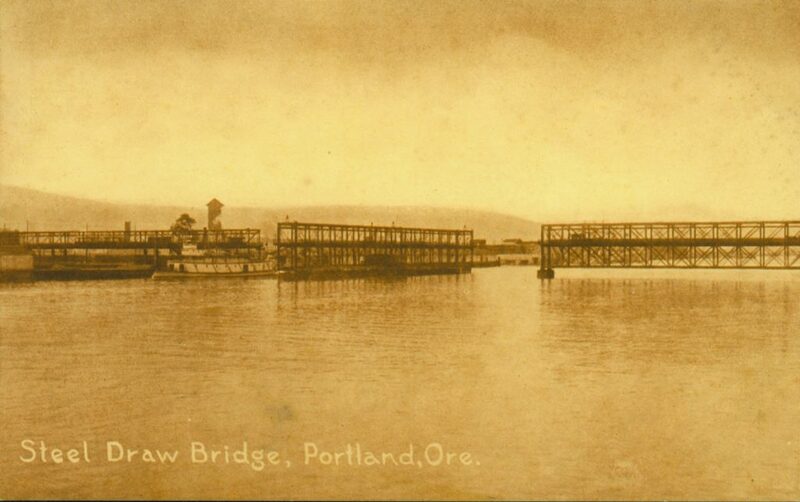 Portland’s first Steel Bridge circa 1890. Photo courtesy of City of Portland Archives. Did you know the Steel Bridge we know today is actually a replacement of the original? Built in 1888, the original Steel Bridge was Portland’s second bridge crossing the Willamette River–the first being the Morrison Bridge, constructed in 1887. It was a double-decked swing span bridge, which let boats pass by pivoting the center span. The bridge was made with steel instead of wrought iron or wood, which was unusual at the time and inspired its name. 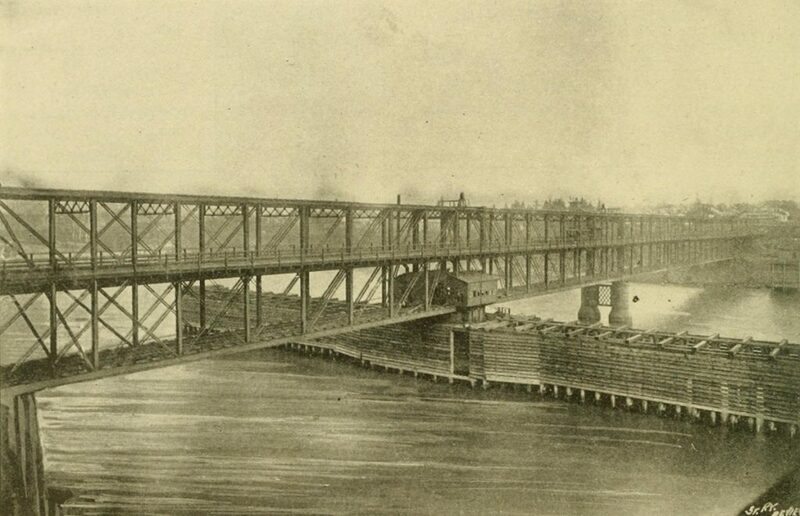 The bottom deck was Portland’s first railroad crossing of the Willamette. Prior to the bridge, passengers had to exit their train, cross the river on a ferry, and reboard another train. The top deck accommodated streetcars, pedestrians, wagons, and later, automobiles. Steel Bridge swung open to let a boat pass circa 1908. Photo courtesy of City of Portland Archives. The Steel Bridge was a vital crossing for the growing city of Portland, but heavy boat traffic required the bridge to open on a near-constant basis. The bridge’s clearance was so low that even small boats needed the bridge to open! The swing mechanism operated slowly, further disrupting traffic. Soon other problems came to light. The bridge could not accommodate either Portland’s growing traffic or heavier modern trains. This triggered construction of a new, improved bridge. 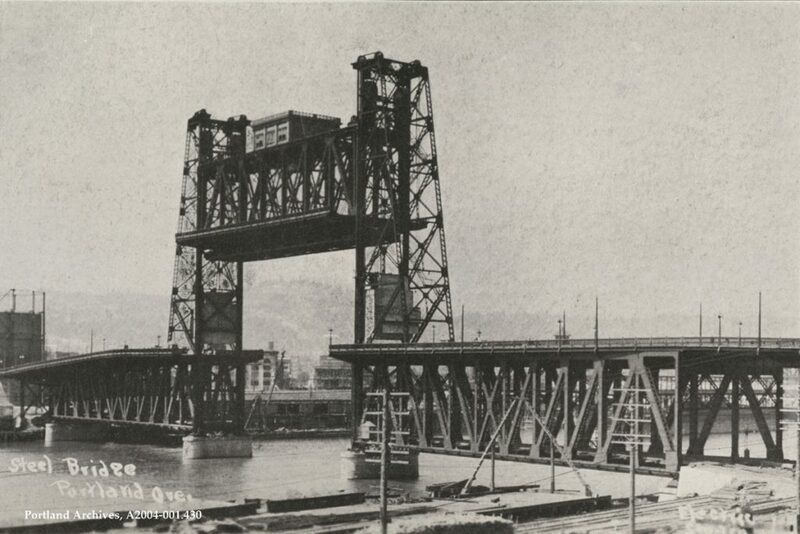 1913 photo of Portland’s new Steel Bridge. Photo courtesy of City of Portland Archives. In July 1912, just 24 years after the first Steel Bridge was completed, the current Steel Bridge opened. It is a double-deck, vertical lift span bridge, which lets boats pass by raising the center section. Higher clearance and a bottom railroad deck that can be raised independently of the top deck means small boats can pass without interfering with traffic. The vertical lift mechanism also operates faster than the previous swing span style. The new bridge kept the “Steel Bridge” name, and the old Steel Bridge was dismantled. 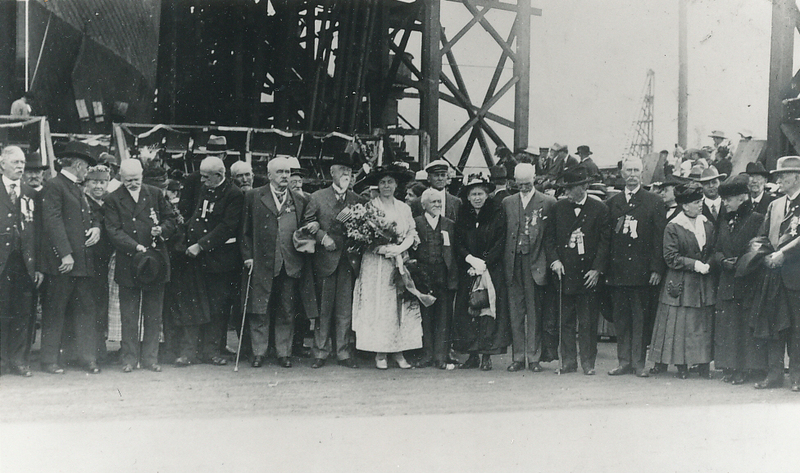 Henry Pittock (at center) celebrates with the crowd at the opening of the new Steel Bridge in July 1912. Today, over 100 years later, the Steel Bridge is still a vital connector of Portland’s east and west sides, providing passage to thousands of cars, buses, MAX light rail, Amtrak trains, freight trains, pedestrians , and cyclists each day!